WØEA Blog! : KX3 Stand and Skip, Skip to my Lou! KX3 Stand and Skip, Skip to my Lou! There's not been a whole lot going on in the W0EA shack lately but I thought it was time for an update of sorts. I've been doing a lot of building kits for folks and I'm still really enjoying it. It is turning out to be a great way to fund my little radio projects. Currently I have another MTR in the works, which will go in a classic Altoids tin this time, so I'll have a post with photos of that when it is done. I've got a softrock receiver on its way as well. The latest addition to the shack is a nice stand for my KX3. 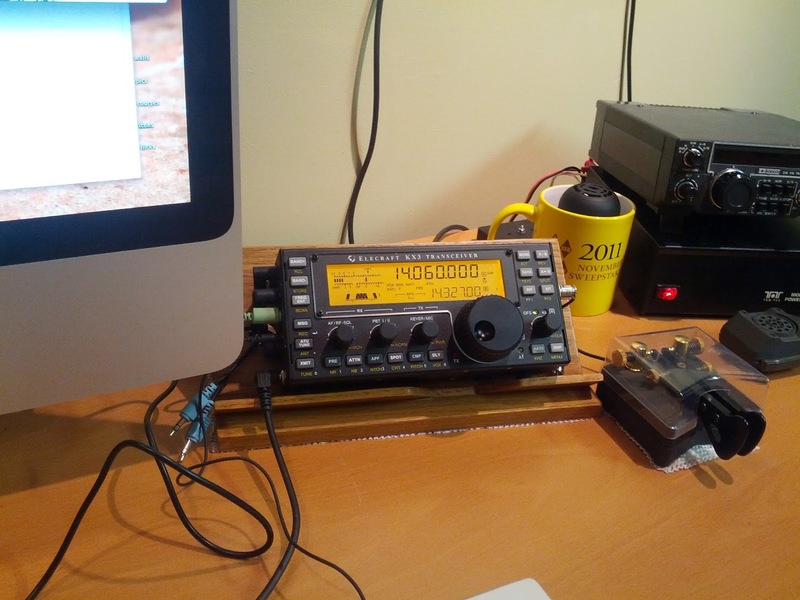 It is inspired by WG0AT's stand and born of a desire to have the KX3 in a more comfortable position in the shack. My stand's features are very similar to Steve's but with a little improvement which makes it stable without any additional weighting. It was designed with Dave Cripe, NM0S, who cut the wood and assembled it for me since I don't have a table saw. Its made out of oak and finished in Minwax water based stain. It turned out great and I'm really happy with it! It fits into my shack perfectly and the angle is spot on (went with 45 degrees). 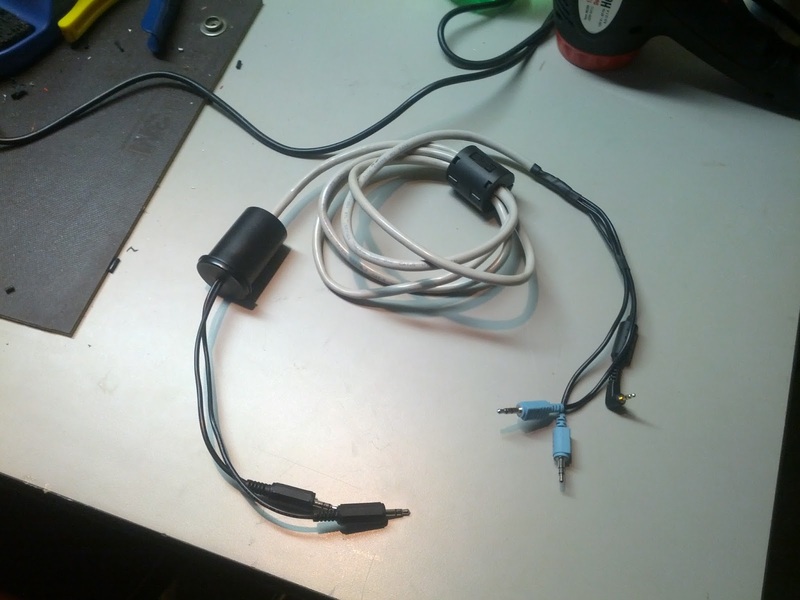 My interface cable: computer on left (audio in and out), rig on left (mic, audio out, I/Q audio) Seen here with Skip Teller device in the film canister and a large ferrite choke installed. I was just using VOX to key the transmitter and sometimes I could get it to key pretty reliably only to come back later, or change bands or something and no longer get it to key and unkey when I wanted it to. Enter: Skip Teller (KH6TY) interface The Skip Teller digital interface has been published in QST a couple times and there was even a nice professional printed circuit board you could buy, but it has since sold out. 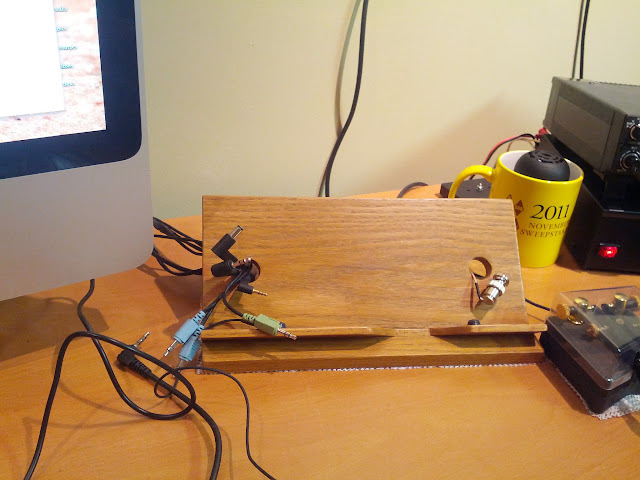 Basically it creates a separate VOX circuit using a simple transistor and a few other parts, but boy does it work! The latest version requires no DC power! Here's what mine looked like after I put it all together in a fairly ugly style. Small enough to fit in a film canister! Also note that the diodes and capacitor values are non-critical. In mine the smaller cap is a 2.2 uF and the big one is a 100uF. The bigger cap (C2 in the schematic) does give you control over how long the TX/RX delay is so the smaller the cap, the shorter delay (or smaller the resistor...). With the 100uF cap in there, my delay is about 500 milliseconds which is fine for any of the stuff I'm doing. You may notice only one transformer. I did not build the receive side of the interface since I don't have enough wires in the bundle to isolate everything and of course it was brought to my attention later that unless I isolate both sides, its not really isolated. I have since removed the transformer and it still works! So far, I'm really happy with it. I don't have any keying problems now and I don't have to worry about the VOX getting stuck open if I'm operating digital modes remotely or something like that. It is really a win-win! How cool is that?! 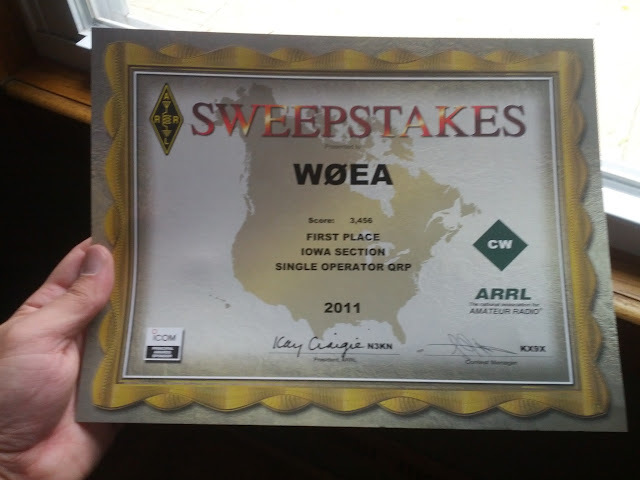 Last year I operated the Sweepstakes at N0MA and participated in the group's first clean sweep on CW then left and worked the Sweeps' from my home QTH which I guess worked out pretty dang well! The next contest is only a few weeks away so I do hope to hear you on the air then! That is a great stand TJ and I am going to have to check out the pic's in much closer formate to make one for my KX3. I have noticed the stands that come with the KX3 are ok for portable op's but for in the shack that stand looks fantastic. I also noticed the iMac beside the KX3!! I have hooked my KX3 up to an iMac as well along with Macloggerdx software. Up to this point I have been a Windows guy but now am migrating to Mac. My K3 and K2 are still running off my Windows programs on a separate PC.